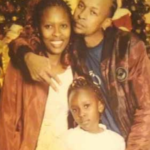 The late Chris Kantai’s wife has opened up on how the rapper used to treat her and why she believes the artist will never be forgotten. Irene who spoke to Word Is, said that Kantai was a very warm-hearted man and made sure his family was happy and always taken care off. “Kantai used to make dinner for me and my daughter almost every day. Chicken and fish filet were his favorite meals. He also rapped for us almost every night and even dedicated songs to me which we then sang together. He was a loving and caring man who made sure I was always comfortable,” she said. Irene said that she would always head to the studio to listen to his work and pick him up. “Sometimes I would go with him to the studio when he’s recording or sometimes I would pick him up. And on our way home and we would listen to the music. In fact, I listened to all his songs. Every day I had to pass by the studio to listen and understand his music,” she said. Phone call Regarding the day he passed on, Irene said that she received a call from the hospital that Kantai was having difficulty in breathing and she rushed there only to find him dead. “I was at home when I was called at 7 am and by 7:30 am I was in the hospital. I was told Chris (a special name I gave him because the family has so many Kantai’s) had breathing problems but by the time I got there, I found him already dead despite rushing to the facility. Kantai will never be forgotten,” she said. The post Kantai’s wife says he will never be forgotten: Every day I had to pass by the studio to listen and understand his music appeared first on Ghafla! Kenya.